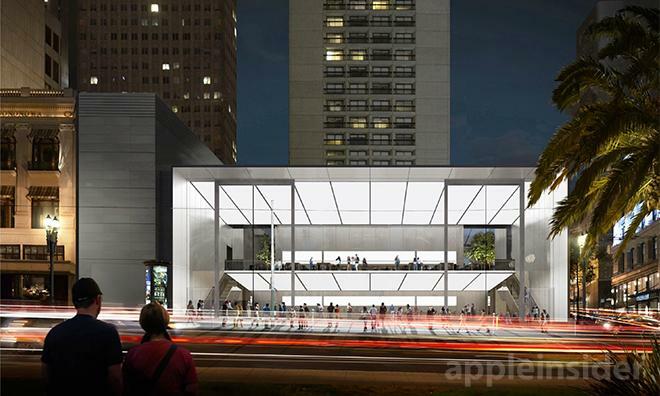 Apple has been given final approval to start its San Francisco flagship store project, which will involve the demolition of a standing building, surrounding environment renovations and construction of a building adhering to a new design style. In a recent hearing, the San Francisco Board of Supervisors signed off on a planning code variance, one of the final steps in a lengthy approval process to build the upcoming Union Square Apple Store, reports ifo Apple Store. City supervisors were called in to settle Apple's latest planning code amendments after the SF Planning Commission could not agree on an approval in February. As previously reported, the new flagship will feature an all-new design theme that takes Apple Stores' "open" feel to another level. The main attraction will be a two story-tall glass facade facing Union Square, allowing passersby a good look inside the store from distance. The building itself will feature a cantilevered design that moves from Post Street to a plaza with waterfall feature in back. The latest submitted renderings show two giant operable 44-foot-tall steel-framed sliding glass doors, as seen above. When closed, the each door forms one of the facade's six panels, which opens to a four-panel arrangement when open. Apple's project has seen a number of changes since being announced in 2013. The build sparked a minor controversy when it was discovered Apple's original plans called for the apparent removal of a fountain designed by local artist Ruth Asawa. The sculpture, which tells the history of San Francisco in 41 plaques made of baker's dough cast in bronze, dates back to 1973. Subsequent plans included concessions to move the "folk art" sculpture ten feet into the plaza, assuaging concerns that the historical piece would be destroyed. Following a second vote on the amendments next week, the mayor must approve the final proposal before construction begins. The store could open by spring 2015 if demolition begins immediately, the publication said.